Because we love Thai and because I found the time and the will to cook. And because I wanted to try something new and finish the sauce packs I hoarded at Bangkok. Because of that, Thai food, it is! 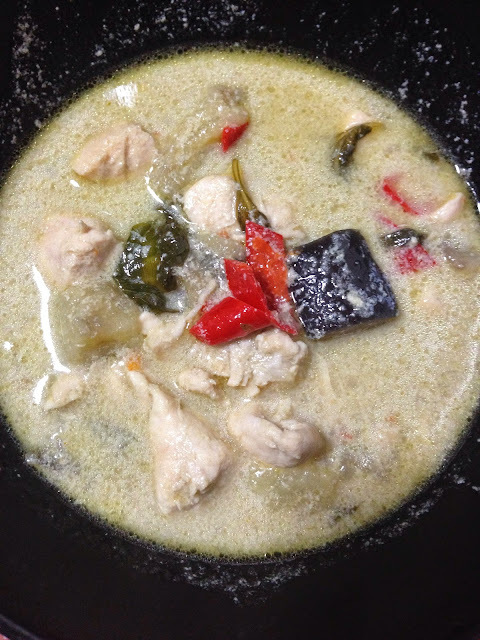 A personal favorite of J, Green Curry Chicken is a dish with a zing. 1. On a medium-heat saucepan, add the coconut milk. When it comes to a boil, add the green curry paste. 2. Add the meat in until it is cooked. Add in the eggplant slices, pepper and sweet basil leaves.